How to Build a Leadership "TV Network" to Compliment Learning Presented by Emma King, Vice President of Learning and Event Strategy & Emma Meyer, Executive Producer, INXPO View Now: http://www.2elearning.com/web-seminars-series/item/56618- how-to-build-a-leadership-tv-network-to-compliment-learning How to Develop Competency Based Learning Programs Presented by Jonathan Poltrack, ADL Director of Operations, Alexandria, VA Dr. Robby Robson, CEO and Chief Scientist, EduWorks Corporation & Dr. Carla Lane, Vice President, FGDLA View Now: http://www.2elearning.com/web-seminars-series/item/56616- how-to-develop-competency-based-program CEO Power Panel: Learning in the Second Digital Decade Presented by Dean Pichee, CEO, BizLibrary, Chris Bond, President, Bluewater Learning & Joe DiDonato, Editor at large, Elearning! Media Group View Now: http://www.2elearning.com/web-seminars-series/item/56628- ceo-power-panel-learning-in-the-second-digital-decade Is Virtual Learning Going Prime Time for Learning? Presented by Richie Djamhur, Head of Culture & Learning, Bing Lee Stores & host of Ritchie's Room with 17 million viewers. 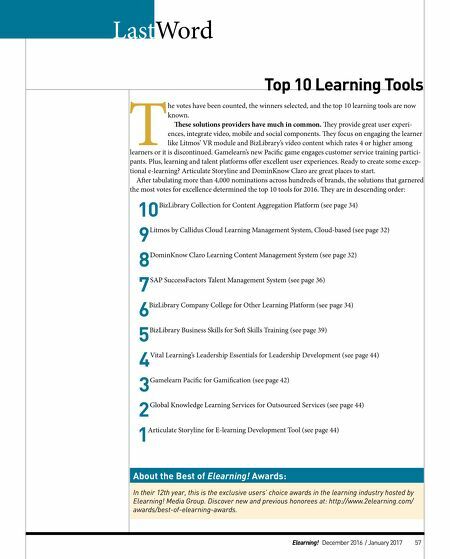 View Now: http://www.2elearning.com/web-seminars-series/item/56500-is-virtual- reality-going-prime-time-for-learning Learning Platforms: Trends & Practices Presented by Joe DiDonato, Editor at large, & Catherine Upton, Publisher, Elearning! Media Group View Now: http://www.2elearning.com/web-seminars-series/item/56477-learning- platforms-trends-practices REGISTER FREE TODAY HOSTED BY: Government Elearning! Web Seminar Series: Best of 2016 You are Invited! Elearning! Web Seminar Series is a product of B2B Media Company LLC www.2elearning.com View the most popular sessions of 2016 on-demand. Catch up on latest trends and best practices from these industry thought-leaders. 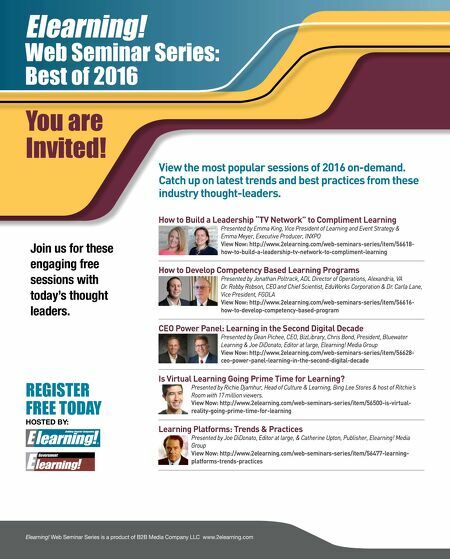 Join us for these engaging free sessions with today's thought leaders.